Within the UK this supermarket is up there at the top for being one of the most successful retailers, giving their customers what they need on a daily basis. When Tesco’s 3 for 2 on toy sale is live for 2019 it will deliver some of the best bargains available. There will always be plenty of toys to choose from when this sale is on, including all types of different LEGO, baby play time products such as push along buggies, play tables, action figures, and all of the popular brands. When is the next Tesco 3 for 2 Toy sale in 2019? This page will inform and keep you updated on the exact date of the next big 3 for 2 toy event, or any of the deals featured up until April 2019. Upcoming dates and leaked information will be left by the community and our editors below. 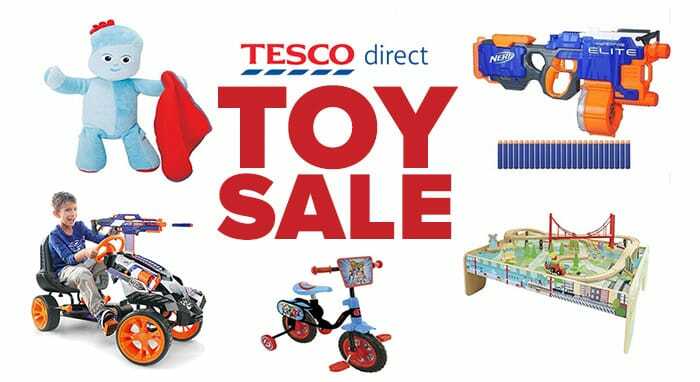 Where to find the toy sale at Tesco – You’ll find all of the deals when they’re live on Tesco’s official page, also exactly when the event has started will be updated on this page. Personally, I prefer the Tesco 3 for 2 than the Argos 3 for 2 on toys. Last time it was on Tesco didn’t up their prices, but Argos did just before it started. When the Tesco 3 for 2 event was live I managed to grab a few bargains! Anyone know the 3 for 2 on toys dates for Tesco’s sales in 2017, not find any details yet online. If you work for tesco give us a comment and let us know. how good are the little hot tubs there on tesco’s website? Very tempted but unsure of the quality!! Yessss, perfect timing!! Kids needed a trampoline and this has just sealed the deal thank you! The latest 3 for 2 Toy Sale at Tesco is now LIVE! You have until April 10 to get your order in, happy shopping everyone. Let us know what you manage to find! when is the next toy sale due for lego? No dates at the moment Heidi, but we will keep you informed if we see Lego on the next sale. Looking for 3 for 2 on NERF toys, any idea when? Thanks! Fantastic news everyone. The next 3 for 2 Toy sale at Tesco will start on Friday October 27! Make sure you let your family and friends know as this sale is going to be huge! Updated the link for the Tesco 3 for 2 page as Tesco seems to have changed it. Sale starts soon guys, what is everyone hoping to buy? Happy shopping! The next Tesco 3 for 2 Toy Sale for November 2017 is about to start everyone. It will begin on Friday November 17 so get ready to spend for Black Friday! Tell your family and friends as this sale is going to be amazing, it always is.